In the month of April, there were a total of 32 single family home sales, down from the 39 sales last month. Of the 32 sales, three were waterfront homes and five were golf view properties. The average price per square foot for non-waterfront homes was $303, slightly down from the $314 average of last month. The average sales per square foot for waterfront homes increased to $623.41, up from $499 last month. However, on both the graph and in this average, I omitted one sale last month. The home at 90 Leucadendra Drive sold for $6,800,000 in the month of April. The home on this property is 5,240 and calculating the price per sq. ft. would have skewed average greatly, as it is very high at $1,307.25. Golf view properties averaged $326.19 per sq. f.t. 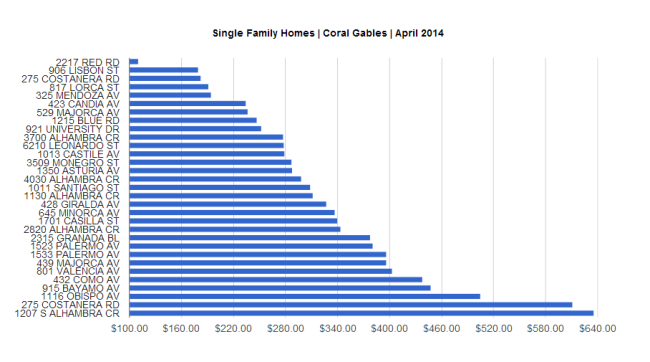 Stay tuned to the blog to see how the trends in Coral Gables change over the month of May! I used to be encouraged this excellent website by means of my personal step-brother. I will be will no longer a number of if this organize is written by means of the pup because no one understand such precise somewhere around my difficulty. You’re astounding! Thanks a lot!